While it’s official launch doesn’t take place until May, Papercutz’s new Charmz imprint is already adding new series and new creators, including a new role for New York Times best-selling author Mariah McCourt. Charmz, a new graphic novel imprint devoted to romance focused fiction and squarely targeted at tween girls was already off to a strong start, with four new series launching this spring. But that’s just the jumping off point for one of the most ambitious comics publishing launches in recent memory. By the end of the year, the line will expand to six ongoing series. And the publisher has brought on an editorial “heavy hitter” naming McCourt as the line editor for the imprint. McCourt’s appointment comes at a time of expansion for the fledgling imprint. In addition to the previously announced debut titles (supernatural romance STITCHED by McCourt & Aaron Alexovich, cosmic adventure ANA & THE COSMIC RACE by Amy Chu & Kata Kane, and European imports CHLOE and SWEETIES), Charmz will add two new series, GFFs and THE SCARLET ROSE, to its lineup this fall. The other new title is THE SCARLET ROSE, the story of a female swashbuckler in 18thcentury France. When Maud sees her father murdered in front of her eyes, she decides to become a champion of justice like the famous “The Fox”. She dons the identity of “The Rose” and uses her sword fighting skills to rescue the innocent. Of course, it’s only a matter of time before she crosses paths with her hero. But what will she do when she finds out “The Fox” is a boy from court that she can’t stand? With its fresh editorial vision and expanding roster of innovative new series, Papercutz’s latest imprint is shaping up to not only be one of the most highly anticipated publishing debuts of 2017 but also the line that brings romance back to comics..
Get ready to be Charmzed! Mett Danica Davidson and Her Dog Porthos! BARBIE:”Puppy Party” writer Danica Davidson drew inspiration from her own life for her first Papercutz graphic novel. Are you ready to meet her dog, Porthos? Puppies and comic books are two things I really love, so that made it a blast for me to write BARBIE:”Puppy Party”. When I was trying to come up with an idea that would involve Barbie, her sisters and their new puppies Honey, DJ, Taffy and Rookie, I got inspiration from my own dog and his story. Meet my beagle Porthos. He’s named after the beagle on Star Trek: Enterprise, who’s named after the Musketeer Porthos in The Three Musketeers. (He is a very literary dog, though he doesn’t know it.) I adopted Porthos from my local shelter about three years ago, when he was one. Before that, he’d been a stray. Now he’s a very happy dog who likes to sniff everything and he sleeps by my feet while I write. (He’s sleeping there right now as I type this. What do you think he’s dreaming?) I thought maybe Barbie and her sisters could help shelter dogs find forever homes. I like to help animals, so I thought Barbie and her sisters would enjoy it, too! So in “Puppy Party”, Barbie finds a lost dog and then learns about the dogs and cats needing homes in the shelter. She puts together a big puppy party to find them all homes and to help the lost dog find his owner. Adopting a dog makes a big difference in their life. Not everyone is able to adopt a pet, but there are also other ways to help out, as Barbie and her sisters find out. You know what else I love besides puppies and comic books? Happy endings, especially for our furry friends. You’re 16-years old and recovering from a tragic car accident. Everyone tells you that your brother is dead but you keep seeing visions of him being carried in to the clouds by a mysterious flying boy. And the visions don’t stop there. You see shadowy figures, pirates, other worlds. Are you going crazy? Even your therapist isn’t sure. That’s why she wants you to draw your visions in a journal. That’s why she wants you to start THE WENDY PROJECT. In Spring 2016 Papercutz scored a major hit with their publication of David Gallaher and Steve Ellis’ THE ONLY LIVING BOY, a title that began life as a web comic. So it’s no surprise that the company would be on the lookout for other digital properties that could successfully transition to the print graphic novel format. Enter McDuffie award nominees Emet Comics and their online sensation THE WENDY PROJECT. After the company’s agent, Dara Hyde, sent materials to Papercutz publisher Terry Nantier; the two companies quickly agreed that THE WENDY PROJECT should be the latest title in Papercutz’s Super Genius imprint. Created by Melissa Jane Osborne (Campus Crush) and featuring stunning artwork by Veronica Fish (now the lead artist on Archie), THE WENDY PROJECT is a new take on the Peter Pan story and a coming of age tale with just the right amount of magic. Readers will be drawn to the compelling story and will empathize with Wendy as she seeks to answer the all-important question – is her journal just the imaginings of a troubled teen … or is it a portal to another world? Global toy leader Mattel (NASDAQ: MAT) today announced a new partnership with Papercutz, “the #1 Kids’ Graphic Novel Publisher”. The agreement gives Papercutz rights to create comics based on the company’s BARBIE character, the best-selling fashion doll that has become a cultural icon. The new partnership will let Papercutz create new material based on the hit BARBIE media properties and on the core franchise. The goal is to provide a range of graphic novels that complement the many ways that children interact with Barbie—from animated movies to interactive media to traditional toys—and to reflect the modern sensibilities and focus on diversity that Mattel has brought to the franchise. The first three titles slated for launch as graphic novels are an eponymous BARBIE series and individual volumes based on the BARBIE STARLIGHT and BARBIE PUPPY ADVENTURE DVD movies. BARBIE and BARBIE: PUPPY PARTY will launch in September 2016, with BARBIE STARLIGHT following in October. All three series will be available in both paperback and hardcover. These three properties are just the start of the ambitious Mattel/Papercutz publishing program. Plans call for more series to debut in the first half of 2017, with new installments and new series appearing each season. BARBIE VOL. 1 and BARBIE: PUPPY PARTY VOL. 1 will be on sale at comicbook stores, online retailers and bookstores everywhere on September 13th. 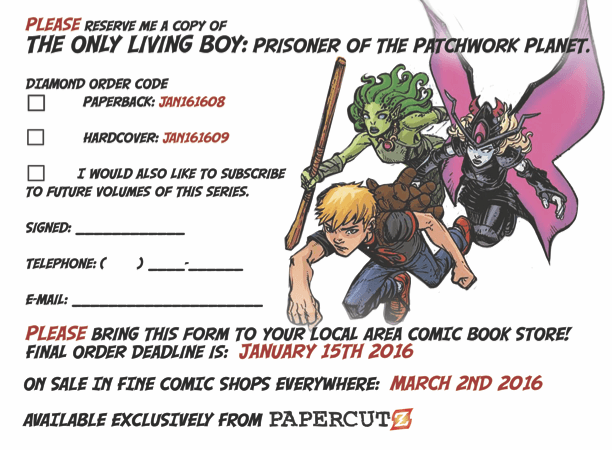 Pre-Order Your Copies of ONLY LIVING BOY VOL. 1 Today! ONLY LIVING BOY VOL. 1 is coming in March but comic book store owners will be placing their orders in the next couple of weeks. If you want to make sure that your store orders you a copy use this handy form.